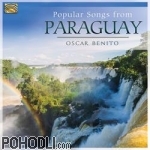 Oscar Benito is a virtuoso harp player from Paraguay, presenting melodious and relaxing music from the wilderness of South America. Music to be enjoyed by a wide variety of tastes. The Paraguayan harp gets its signature sound from the wood used to build it, producing a unique and magical sound. Page generated 23.4.2019 at 03:05:19 in 0.22 seconds.